On one of the increasingly rare weekends without a UFC card, Bellator MMA touched down in Los Angeles, California with Bellator 170, one of its most stacked events to date. Highlighted by the final fight of an MMA legend, the comeback of a fan favorite, and an unforgettable knockout win, this latest Bellator card was a great one. Here’s a recap of the action for those who missed it! The main event of the evening saw MMA legend Tito Ortiz take on three-time UFC title challenger and iconic mouth piece Sonnen in a clash of veteran, West Coast wrestlers. Though Sonnen appeared to have more good years ahead of him in advance of this contest, he was soundly outworked on fight night. After taking Sonnen down in the fight’s opening seconds, Ortiz snaked his way out of a guillotine attempt to climb into full mount, then take his foe’s back, and finally, lock up a rear-naked choke for the win. Sonnen’s tap came at the 2:03 mark of round one. In victory, Ortiz returns to the win column after coming up short in a recent bid to unseat former Bellator light heavyweight champ Liam McGeary. With the win, he’s 19-12-1 overall. The most important detail of this fight, of course, is that it will be the last of Ortiz’s legendary career. He had his son lay his gloves in the center of the cage before riding off into the sunset for good. In defeat, Sonnen falls onto a two-fight skid, having lost his last fight to Rashad Evans back in 2013. “The Bad Guy” is now 28-15-1 in sum. After the announcement that a rematch between Quinton “Rampage” Jackson and Muhammed “King Mo” Lawal would headline a Bellator show on March 31, the action continued in the welterweight division, where British knockout artist Paul Daley took on a fellow big puncher in Brennan Ward. It was arguably the most anticipated bout of the night, and it lived up to the hype. After being taken down twice in the bout’s early moments, Daley created some space with a beautiful spinning back elbow, then turned his foe off completely with a rocket-fuelled flying knee to the dome. This incredible knockout win, which was reminiscent of the one Michael “Venom” Page landed on Evangelista “Cyborg” Santos in 2016, occurred at the 2:27 mark of round one. With this win, Daley rebounds from a recent decision loss to reigning Bellator welterweight king Douglas Lima. 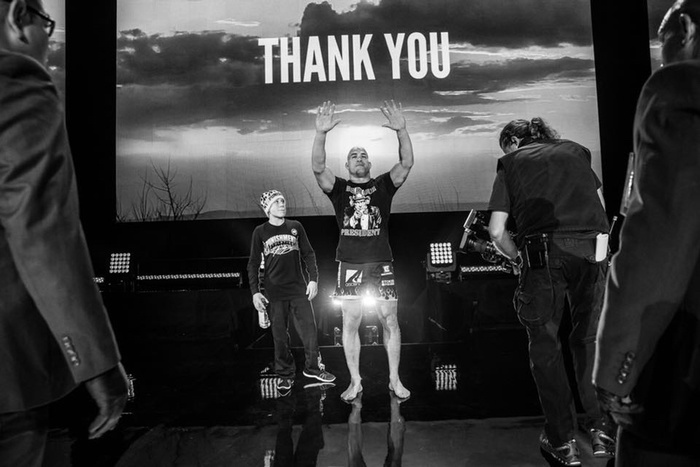 Now 39-14-2 overall, he remains one of Bellator’s top welterweights. Post-fight, he used his station in the division to make a callout of former UFC title challenger and recent Bellator signee Rory MacDonald. In defeat, Ward returns to the loss column after a recent knockout defeat of Saad Award. He’s now 14-4-0. The middle bout of the main card was a compelling middleweight style clash, as BJJ legend Ralek Gracie returned from a seven-year MMA hiatus against venomous striker Hisaki Kato. Unfortunately, this interesting clash of styles was a bit of a slow one. For the duration of the first two rounds, Kato was content to fight off his back foot, peppering his foe with solitary punches and leg kicks. In the third, Gracie was able to drag the fight to the mat—even climbing into full-mount—but he was unable to make anything happen, and so it was too little, too late. All three judges scored it for the French-Japanese striker. In victory, Kato extends his win-streak to three, and establishes himself as one of Bellator’s top middleweight contenders. He’s now 8-2 in sum. Gracie, meanwhile, loses for the first time as a mixed martial artist. He’s now 3-1 in overall. The second bout of the main card occurred at featherweight, where former Tachi Palace Fights and World Series of Fighting champion Georgi Karakhanyan took on the talented Emmanuel Sanchez in a compelling clash of featherweight contenders. This fight was a difficult one to score. While Sanchez seemed to win round one, and clearly won round two—which ordinarily would have earned him the victory—he was docked a point in the second when he blasted Karakhanyan with a pair of illegal knees. From there, Karakhanyan surged back in the third, controlling the fight on the mat. Given Sanchez’s second round point-deduction, it looked as though we could be in for a draw—and one judge scored it as such. Ultimately, however, Sanchez walked away with a majority decision win, as two judges awarded him a 9-8 second round. With this win, Sanchez rebounds from a split decision loss to Daniel Weichsel, and reaffirms himself as one of Bellator’s top 145-pounders. He’s now 14-3-0 in sum. Karakhanyan, meanwhile, has a two-fight streak snapped by the loss, and now sits at 26-7-1 overall. Bellator 170’s main card was kicked off by an intriguing clash of lightweight contenders as Derek Anderson took on Derek Campos. Though Anderson started strong, probably winning the bout’s action-packed first round, Campos found his groove in the second and third, dropping his young foe with an elbow and finding some success with his wrestling—undeniably his bread and butter. The end result then, was a pretty clear-cut two rounds to one for Campos, who was awarded a unanimous decision win as a result. In victory, Campos extends his win-streak to three, having knocked out Melvin Guillard and decisioned Djamil Chan in his two most recent bouts. With this latest win, he establishes himself as one of the top contenders for Michael Chandler’s Bellator lightweight crown. He’s now 18-6 overall. Anderson, meanwhile, has a two-fight streak snapped by this loss. He’s now 14-3 overall.